While the main opposition party took a right turn, Macron was selling fighter jets, saving the Earth, delivering two eulogies and acted as the unofficial king of Europe. This month, the President’s schedule is fuller than a stuffed Christmas turkey. Two years after the Cop 21 Summit, Emmanuel Macron thought it would be a good idea to organise a new climate gathering in a Parisian suburb. Leonardo DiCaprio, Arnold Schwarzenegger, Elon Musk and around 50 heads of state tried to make the Planet Great again (for the umpteenth time) by setting the scene for green investment. Donald Trump wasn’t there. In fact, the President of the only nation on earth to have rejected the 2015 global pact, was not even invited. Unlike the Summit in 2015, there was no reason for joy this time: “We are losing the battle; we are not going fast enough, it is a tragedy”, the French President said. His efforts may indeed come in vain: more and more scientists are saying that it is already too late. Two cultural icons exchanged the temporary for the eternal last week. First, writer, journalist and Académicien Jean d’Ormesson (92) passed a way. 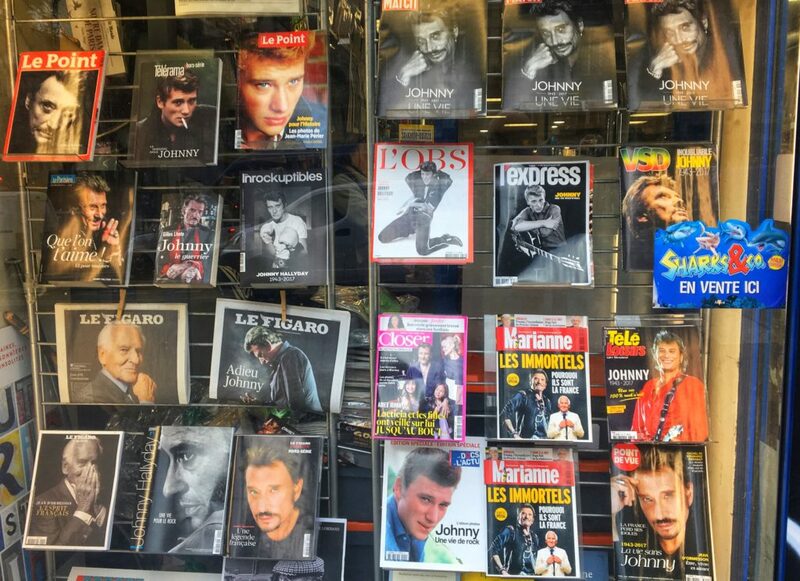 A day later, rocker Johnny Hallyday (74) followed him up the stairways to heaven. It meant Macron had to work overtime, having two separate eulogies in just 24 hours (read the first one here, and read or watch the second). Hallyday, born Jean-Philippe Léo Smet, sold more than 110 million records worldwide. During the national service for D’Ormesson at the Invalides in Paris on Friday, Macron laid a pencil on the writer’s coffin. On Saturday, while foreign media wondered who this ‘French Elvis’ was, Macron was awaiting the funeral procession at the Madeleine Church in the heart of the capital. Tens of thousands of fans braved the cold and lined the streets to pay tribute to Hallyday. His homage to ‘Johnny’ was the French President’s way of showing that he is not only Jupiter but close to the ‘ordinary people’ too. Not everyone bought the homages. These were not, after all, Gandhi-like statesmen, but just two old (or, in the case of D’Ormesson, very old) entertainers. They both were loved, but D’Ormesson was a mediocre writer at best, while Hallyday preferred tax havens to his own country. Hallyday’s very catholic obsequies almost degenerated into a constitutional crisis. The President was about to make a religious gesturein front of the coffin, something French office-bearers have not been allowed to do, since the implementation of the 1905 Laïcité Law. Fortunately, Macron changed his mind just in time. Valérie Pécresse, the conservative president of the Ile-de-France region, on the other hand, couldn’t help herself. Defence Minister Florence Parly promised Belgium four billion euros if the country opts to buy French Rafales. Parly’s promise was made in an op-ed in the newspaper De Tijd. Belgium needs to replace its obsolete F-16 fleet with at least 34 new fighter planes, a project with a price tag of around fifteen billion euros. In October, France refused to respond to the public tender, much to the annoyance of Defence Minister Steven Vandeput. Parly’s letter is a last-minute charm offensive, but bribery might be a better word. The battle is now on between the American F-35(aka the much-plagued Joint Strike Fighter, chosen by the UK, the Netherlands and a string of other nations) and the British-Spanish-Italian-German Eurofighter Typhoon. In response to Parly’s offer, the governments of these countries also threw their weight around, hoping to convince Belgium. According to a former fighter pilot, the failure to sell the warplanes to its northern neighbour is “another Waterloo”. Nevertheless, the French have not given up hope. Earlier this year, Belgium bought 500 armoured vehicles from France. The small kingdom, furthermore, is firmly in favour of close European defence integration (a plan that dates back to 1952, but was sabotaged by the French Parliament) and is planning to invest heavily in the army in the years to come. In spite of the Belgian setback, Emmanuel Macron proved to be an excellent travelling salesman. On a visit to Qatar, he signed a contract for the delivery of twelve Rafales. It turned out to be a bitter-sweet victory: three days after Macron’s visit, the oil state bought 24 Typhoons from arch-rival (and Waterloo-winner) Great Britain. In the second decisive round of the regional elections in Corsica, the nationalists received 56.5 percent of the votes on Sunday, their highest number in history. Gilles Simeoni becomes the new president of the region. Macron’s party only won 12.67 percent on the island. Even though independence is not an issue, Corsica wants more autonomy as soon as possible. An independence push could be next. In a phone call Sunday night, Prime Minister Philippe invited Simeoni to come to Paris, to discuss the new situation. “The ball is in the government’s court”, said a Simeoni. Shortly after the results came in, a bomb explodedin Bastia. Members of the Republicans (LR), the main opposition party, also went to the polls this weekend. They chose ‘hardliner’ Laurent Wauquiez (42), who got 74.64 percent of the vote. He is to succeed Nicolas Sarkozy as party leader. Wauquiez has to rebuild the party after the run of election defeats and legal scandals of the past year. The LR supporters expressed their preference for a political line that shifts to the extreme right. Wauquiez hopes to lure voters away from the Front National, alienating historical centre figures such as Alain Juppé and Jean-Pierre Raffarin. The feigned unity did not last long. On Monday evening, Xavier Bertrand, former minister and President of the region Hauts-de-France, slammed the door. Five other prominent members followed suit the next day. Others are also expected to leave the party. About 60 percent of the French people agree with the leavers and view Wauquiez’s election as bad news. The Front National party will be prosecuted for alleged fraud at the European Parliament. Marine Le Pen had already been charged with the same case. She has no intention of quitting her political career: “As long as my country needs me, I’ll be there”. +++ At this week’s Euro Summit in Brussels, Macron will most probably take over Merkel’s position as Europe’s most influential leader. France became the EU’s most powerful country, according to a matrix by Politico. Brits will not be happy: their country is left with zero power. +++ François Ruffin, a left-wing MP and a publisher, was fined 1,378 euros for wearing a football shirt in the Assemblée. In a speech, he pleaded to increase the budget for amateur sports. +++ After the last general election, no less than 1405 political assistants and party employees were laid off. There’s no need to feel sorry for them: they received a total of 36 million euros in severance pay, and many found new jobs as a consultant or as lobbyists. +++ The trialagainst former minister Georges Tron started on Monday. Tron was forced to resign in 2011 after several women accused him of sexual assault. +++ Two weeks ago, I reported that former Prime Minister François Fillon had finally found a job in the real world. Last week, the fanatical car enthusiast got another appointment. He became the chairman of the Constructors’ Committee at the FIA, the International Motorsports Federation. +++ The extreme-right mayor Robert Menard, from the southern town of Béziers, wants a TGV station. He, thus, launched a campaign that was so tasteless, that several police reports were filed against him. +++ Jean-Luc Mélenchon, party leader of the extreme left-wing Insoumis, started a petition. He is angry about the “liars, the cheaters” working for the public broadcaster France Télévisions. Due to his dissatisfaction with the hacks, the politician launched his own ‘independent’ medium this week, modestly named Le Média. +++ Philippe Leglise-Costa is France’s new ambassador to the European Union. Read about why this is an important transfer here.+++Still looking for Christmas gifts? Order a Macron Action figure. Or perhaps this more decorative piece, a tasteful snow globe with the young President’s effigy. Thank you for reading this newsletter. If you liked it, please share it on Facebook or Twitter, or with your colleagues and friends who are also interested in France. I welcome your questions and comments on news@devries.fr. Are you still hungry for information about France? Then please subscribe to So French!, the bi-weekly podcast I co-host, available in iTunes or Tunein Radio. The latest episode is online now (Friday). NEW: If you would like to receive news about French politics on your smartphone, subscribe to the Telegram channel French Politics.